Copyright �2006 PopEntertainment.com. All rights reserved. Posted: November 17, 2006. Working on the outskirts of the Hollywood movie community, actor-writer-director Christopher Guest has put together the most consistently funny troupe in films. Specializing in improvisational movies � many which are hilarious turns on documentaries � Guest has made some of the great comedies of the last twenty-five years. It all started when he and his partners Harry Shearer and Michael McKean created the ultimate rock and roll parody, This is Spinal Tap, with director Rob Reiner. The movie was a cult favorite � so much so that it spawned two albums, singles, a couple of tours and two post movie videos. In fact, as this article is being written, Guest is appearing in a Volkswagen commercial as Tap guitarist Nigel Tufnel. 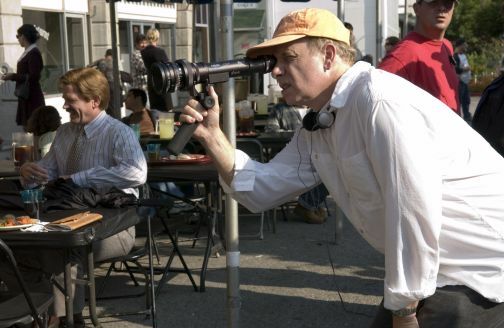 Guest, McKean and Shearer have worked together in many films since � including The Big Picture (1989 � without Shearer), Waiting for Guffman (1996), Best In Show (1999) and A Mighty Wind (2003). All of them celebrate forms of show business and the people who have the drive and the love to try to take them on � even if they don�t always have the talent. By Guffman, Guest had hooked up with former Second City TV stars Catherine O�Hara and Eugene Levy. Other talented minds joined up like indie actress Parker Posey, character actors such as Bob Balaban, as well as longtime comic actors Fred Willard, Jane Lynch, John Michael Higgins and Jennifer Coolidge. However, he is really in his zone with his improvised show business films. The latest is For Your Consideration, a look at the making of a little movie which becomes besieged by Oscar fever. A couple of weeks before the opening of For Your Consideration, Guest, Levy, O�Hara, Shearer and Posey all sat down with us at the Waldorf-Astoria in New York to discuss the new film and what makes their movies work. In For Your Consideration, I love the fact that you have these characters who even at the hint of an Oscar go totally overboard. Is that how it really is? Christopher Guest: Absolutely, yeah. I think we�ve both been through it in our careers and seeing this happen. It�s kind of like an airborne virus, really. No person that hears that can process that in a healthy way. You hear it and there it is. It�s inside you and you�re gone. You�re done. You�re cooked. That�s it. Eugene Levy: I think as opposed to Catherine�s character, if you have some degree of intelligence about you, you would be flattered and you still are trying to kind of get this thing out of your head. 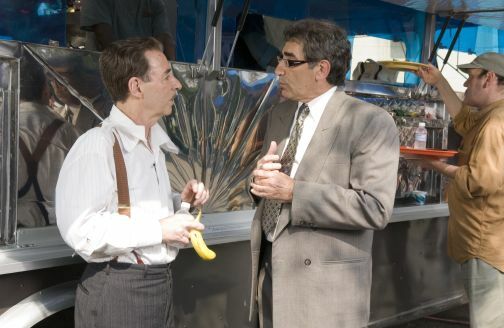 Eugene Levy: No, no, well the point is that you can�t. You can�t do it. But you don�t necessarily jump to, �I�ve got a shot at the Oscar.� You don�t necessarily go there. Christopher Guest: Some people would. Eugene Levy: Well, certainly Marilyn Hack did. But you find yourself talking to yourself. Even if you say, �You know what? Ridiculous. Don�t even think about it.� Now you�re talking to yourself. About it. And you can�t get it out of your head. Have you ever been in the middle of the award mania like in this film? Catherine O�Hara: No. Never, never even close. (laughs) Yeah, I have an Emmy. For writing, for a show I used to do with Eugene Levy and a bunch of people � SCTV. We were all very excited. We did the show in Toronto and Edmonton and it was all about the work (chuckles) all day long. We were all in the hotel � I mean the producer just took us away from everything familiar to us and our homes and families so it would be all about the work. Christopher Guest: When I was fairly young � twenty-three, twenty-four � I was nominated for a Grammy award three times in a series of a few years. Lost all those. Twenty years later, we both won for A Mighty Wind, weirdly enough. I�ve had both sides of this. Emmy Awards� we�ve both had Emmy Awards. We�ve both been up for awards and lost and won, but it�s also meeting other people that have been through this. It�s a really tragically bizarre situation. I�ve known actors that are quite well-known where they�ve just heard from someone � not anyone � just someone, �You should win.� Rumors, rumors, rumors� Then it actually finds its way into print. Then there�s nothing. There�s no nomination. And then they are absolutely bottomed out, based on nothing other than the guy in the hardware store saying, �I think you�� Seriously, it doesn�t have to be more than that. Then it gains some credence. In the same way that we�ve got this internet thing. We talked a long time about, what would be the beginning of this germ? The internet is perfect, because it�s just, �What? Who the hell? What is this?� You can�t really pin it down. Eugene Levy: Well that�s where it happens. Christopher Guest: And it gets out and millions of people see it. Some person that actually writes an actual newspaper might say, �Well, we hear that�,� and you�re done. Then, it�s almost reality. But it isn�t. It�s just madness. It�s just complete madness. You guys have done these great films where you�re really making fun and kind of like fighting the system. Now you�re doing one about Hollywood, about your craft. Did you dig in with a little more glee this time? Catherine O�Hara: Don�t get caught saying �mockumentary� with Chris. Documentary. (laughs) It�s true. We never make fun of anyone. I think when you�re in it and you improvise and you�re trying to be in character, you�re not outside making fun. I�m sure when they�re writing it, there�s got to be some laughs about the kind of people they�re writing about. Then when we first read it, I guess we�re laughing, imagining the whole thing. But when we�re actually improvising, you�re just trying to be in character. (laughs) But, it�s actually a little more torturous doing this, because it�s a little too close to home. For me, anyway. 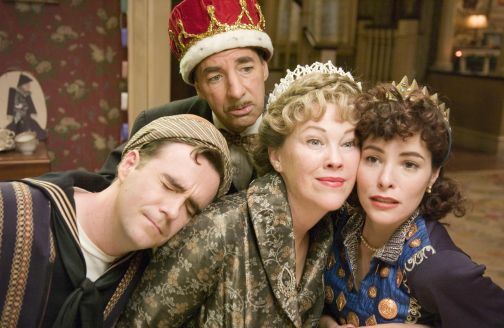 Parker Posey: It�s not a mean send up at all. I think it�s very compassionate. Harry Shearer: In some ways, it is. It�s, I think, by locating a particular tier of work that Chris and Gene did, they allowed us to escape the depicting some truly awful and abusive behavior that goes on at a slightly higher salary level in Hollywood. 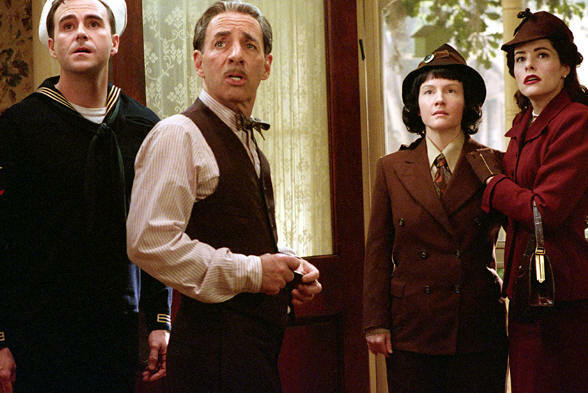 Harry Shearer: You know, Morley Orfkin, as bad an agent as he is, is just a bad agent. He�s not a loathsome or larcenous one like a few agents. Eugene, how did your agent feel about your role? Christopher Guest: (to Levy) You have an agent? 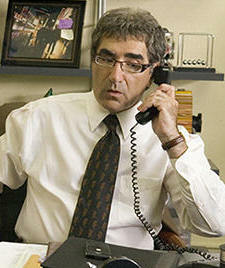 Eugene Levy: Yeah. Not any more. (laughs) Thank you for encouraging me to do the part. No, they took it with a good sense of humor. So they say. Christopher Guest: You haven�t heard from them since. Christopher Guest: Well, in the case of the agent he plays, he�s not getting any calls. Eugene Levy: That�s the other thing, of course. There are no calls. The only thing I can say is we really tried� I couldn�t have lowered the mental bar any lower on this character, to the point where you think no one could possibly recognize themselves. Being that dumb. But maybe I�m wrong. Speaking of lowering the mental bar, some of my favorite scenes were with Fred and Jane Lynch in the take offs of the �info-tainment� shows. How hard was it to get into that kind of shallow, vapid mindset? Eugene Levy: That was beautiful. Christopher Guest: That�s the most fun stuff. Eugene Levy: We wrote � that dialogue is actually written and was on prompters, because I wanted to have that� it�s a very subtle difference when someone�s reading from a prompter, it�s different from if they�d memorized it. They were unbelievable. Unbelievable. Christopher Guest: I had never seen those shows. I actually got someone to make me some tapes of those kinds of shows. It was pretty shocking. Truly, I�d never seen them. Christopher Guest: Thank you for saying that. No, no, seriously, because most people use the term� another term which I don�t want to bring up� That�s the first time I�ve heard that. Christopher Guest: Oh, then it doesn�t count. I take it back. This actually kind of reminded me a bit of one of your earlier films, The Big Picture. How is doing a more straight-forward film different? Christopher Guest: Well, this is a narrative. It�s not done in documentary style, so that is different. But it is improvised. The Big Picture we wrote the script � I wrote the script with Michael McKean. So this is different because it goes from scene to scene. I�d think you must have a real fan base amongst other actors who are jealous you get to work this way� Do you get constantly besieged by people wanting to get in? Christopher Guest: I think that besieged is strong, but people do come up to me that are known actors, good actors, and write me letters. Yeah, I do. Christopher Guest: I do. I do respond. Generally the thing is, if they�re very famous � certainly for when we�re doing the documentary films � it didn�t work at all. It didn�t make any sense. In this area, it still sticks out a bit if you were to say to Tom Cruise, now you�re playing the part of a thing� It�s a little odd. Did Tom Cruise call you? Christopher Guest: No, he actually didn�t. Let�s say he hadn�t. But it does come up, known people in movies. But if they don�t really fit in � this is a very specific kind of work. It�s not everyone that you can say, oh, yeah, just jump on. Sure. I�d love to know the process where you let them down easy. Christopher Guest: You basically say thank you, that�s very nice. I don�t know what else to say. We�ve added to this company. This is now larger than it was, obviously, when we first made these movies. Richard Kind and Sandra Oh are in a scene. Sandra�s a well-known actor� and so is Richard actually. They�ve both done a lot and really were perfect for those parts. But you can only expand so much. Are you ever around acting friends who say to you, hey can you put in a good word for me or maybe introduce me to Chris and Eugene? Oh, he's great. What did you tell him? Parker Posey: I just shrugged. I said, do you want to go to the screening? He was, �I don�t know if I want to schmooze� Go up to him and introduce myself to them. They must get that all the time.� It�s kind of, I don�t know. I probably wouldn�t introduce them. I don�t know, I don�t know how I�d handle it. How do you know if an actor would fit in? 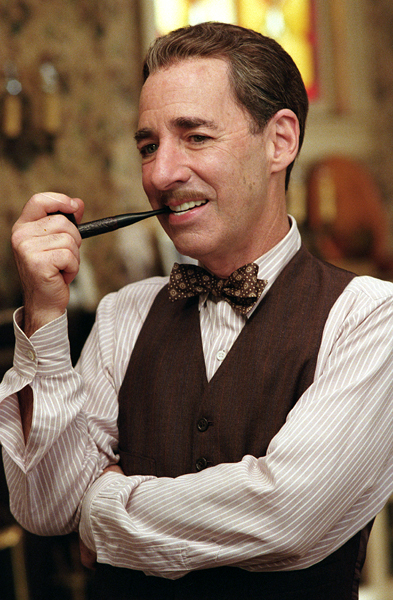 Harry Shearer: I think there are actors who like to work that way and actors who don�t. Who would be terrified by it. Most of my friends who are actors are already in these pictures, so I don�t have that problem. I have a lot of non-show business friends, so� They don�t want to be in these movies. Parker Posey: Part, too, is if you�re ever on a set and they say, �We�re going to improvise this,� and everyone just starts sweating and going crazy. Everyone needs to get their line in. It takes a particular type of energy in a director to make it work. Chris is incredibly kind and trusting. You don�t get that. You don�t get that feeling. You don�t get the support of knowing that you�re working with these great actors. Because it�s a lot of trust. An incredible amount of trust. Like balancing a bunch of books on your head and walking. You have to focus, but you have to relax at the same time. Parker Posey: Not know the cameras are on. Harry Shearer: Not know the cameras are on, not think anything is going on. There is so little of that high pressurized thing. It�s the opposite of that. That�s what allows everybody to relax. To hide the fear into the doing the stuff. Does Chris ever get mad? Catherine O�Hara: Chris get mad? Uh, yeah, well� Not to us. No, he�s really kind. He�s like Corky from Waiting for Guffman on the set. He�s so loving. He just makes you feel you can do no wrong. He can be very funny and dry about things in the world. He�s an unusual guy. I can�t even claim to know him that well, really. I�m glad to get to work with him and be in his circle. He is so loving and affectionate, once he lets you in that he�s very careful with people he doesn�t know. I�ve heard him be fed up with things in the world. Frustrated with things in the world. But he doesn�t gossip, so you feel stupid if you do. And I know he really takes care of his characters. He�s very respectful of [them], even though I know it looks like we�re really making fun of people and going for the jugular sometimes, honestly, I know we�re kidding ourselves, but it doesn�t feel that way when we�re doing it. In this movie� on the set, you talk about this, you talk about that. He never let any characters talk about another character when they weren�t in the room. How do you keep from just cracking up? 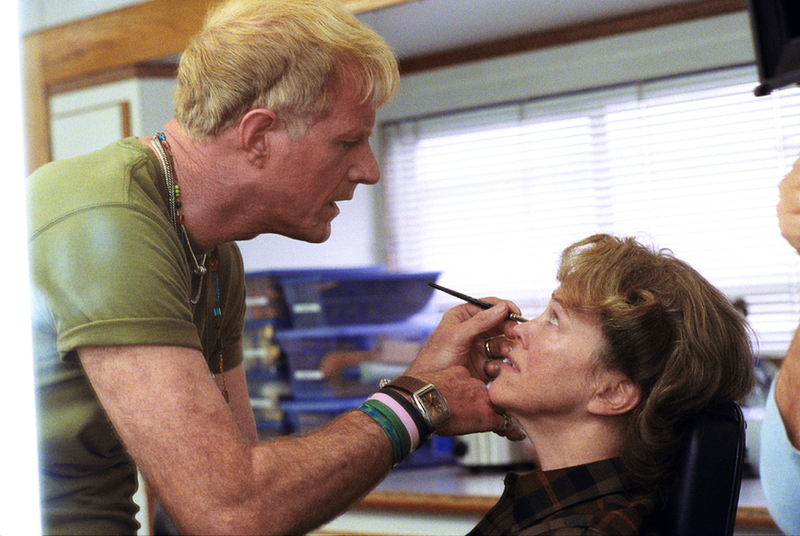 How do you keep from laughing when you�re directing or acting? Eugene Levy: Don�t even ask. Christopher Guest: Every once in a while people laugh at a scene. It doesn�t happen all that much. Catherine O�Hara: You don�t. You can�t. You�re improvising, everybody is improvising and trying to be in character. If you look through your character and you see this ridiculous bit that someone else is doing, you can find a way to� Like Eugene Levy in Waiting for Guffman. We were all on the same set all the time. It would be they go to rehearsal. It was the first movie that we did together this way, too. Fred Willard was insanely funny. Eugene would be laughing all the time and he would go and look at curtains. Anything, find a way to look at a book shelf. Go around a corner. The moment will never happen the same way again. Even with a script, it�s not the same from take to take � especially when different words are coming out, it really never will happen the same. You don�t want to sabotage it. And that kind of is, you blow it. You sabotage yourself or the other people. The take is gone forever if you just start laughing. Christopher Guest: It will never happen again. Eugene Levy: � we can�t duplicate again. If you say, oh, no, we�ve ruined that. Oh, no, no, no. Well, let�s do exactly what you did before when you said the line. It�s not the same. So you have to have the strength to not laugh and sabotage the take. Catherine O�Hara: You can laugh in character. If your character finds it funny, that�s a way to do it. I�ll never forget when we did this dinner scene and I was playing drunk and Eugene and I were trying not to laugh for the whole scene. I was drunk so I was so undisciplined anyway. I could just (makes drunken gesture) whatever� One part � and it�s in the movie � I go down like I dropped something, to pick [it] up. I was just going under the table to laugh. It does happen. But for the most part, we�re all, �I�m in character. You�re in character.� We�re there. 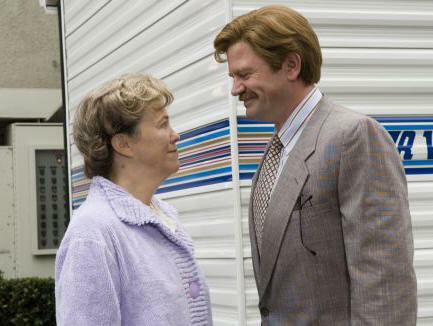 And my character in this movie is so not inherently funny that I took every moment seriously. If people were being funny, my Marilyn didn�t even get it. What makes you decide on the subjects? Christopher Guest: Sometimes, things come to me. Then I�ll call Gene and say, �How about this?� If I�m lucky enough to have an idea, I�ll call him up and say, �Maybe we can do this.� That�s how. Do you ever have ideas, Eugene? Eugene Levy: Yeah, they�re all turned down. How much do you know when you go into these projects? Catherine O�Hara: You have the script. You have the whole script. 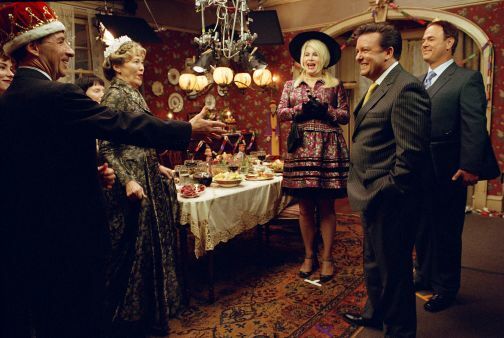 A script with no dialogue; except � in this movie � the Home for Purim scenes. If you can believe it, that dialogue was written. (laughs) I don�t believe anybody could make it up. The Home for Purim stuff was all written and so melodramatic. Was it hard to stay straight? Harry Shearer: About a million times. Parker Posey: � about a million times. Harry Shearer: Do you remember it now? Harry Shearer: The thing about these is that you don�t have to talk. There�s no expectation that you�re going to talk, you�re going to score, you�re going to come up with a great line. You just have to be your character in the scene and you need something. Victor needs something in the scene. You just have to figure out a way to get it. Otherwise, there are plenty of talented people there to carry a scene. It�s not on anybody to save the thing. It�s not even if you don�t have anything. It�s not like you come to the set with� you can� we were talking about this in an earlier session, you do work beforehand and I take walks every night and think about it the next day. Then you take those intentions and leave them at the door, because what happens in the scene is not up to you. It�s up to this group consciousness that evolves when all of these characters come into interplay. So, even if you don�t think you have anything when it starts, you may surprise yourself. And vice versa. Do you ever get tired of each other after working together on so many movies? Are you afraid you won�t come up with anything that�s funny? Did you have people in mind that you were parodying, or was it just your own experience? Christopher Guest: It�s a conglomerate of twenty different people that I�ve met. Harry Shearer: It was much more like this guy is just like me, seriously, if I couldn�t go do other stuff. If I couldn�t go off and do Simpsons and write a book or do other things and I was just waiting for the phone to ring for my next acting gig. I would be in Victor�s shoes. So that was really the work I did, I just stripped away all that other coping mechanisms and Victor is what�s left � this puddle of vulnerability and yearning. Parker Posey: I think with Callie, she has a lot of feeling and a big need to express. I think she should be in therapy instead of on stage. This is what happens when you can�t go to therapy. Do you become an actor? Do you do a one-woman show? Do you think you�re an actor? I don�t live in LA, so I get to kind of look at it and observe it when I go out there. I know there�s a lot of road rage, as well as a sense of entitlement. There�s a lot of stardom in the culture. Parker just mentioned that she�s not living in LA, and Chris also said that earlier. Do you think these things feel so free because it is not a whole bunch of people who are immersed in show business? Harry Shearer: Partners of mine, we were in a comedy group and partners of mine took characters from that group and basically walked into a little show called Laverne and Shirley. I was brought along to work with them on those characters. Garry Marshall kept saying, (imitates him) �You be a guy in the drive-in with the things.� I�m saying to myself in my head, over my dead body. Harry Shearer: Thank you� He�s nice, Garry. 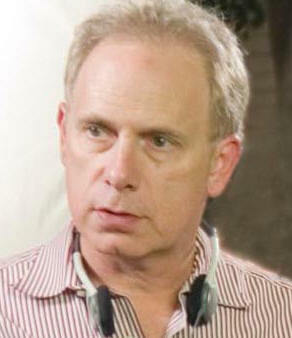 Christopher Guest: Well, I don�t know. I guess if that�s true, that�s good. As opposed to the other scenario � of that not happening. I don�t know. I don�t really think about that. I think we�re fortunate because we can make these movies and we can control these movies and then they go out there and nobody messes with them. There�s no director�s cut. That is the director�s cut. So, I guess I�m very fortunate to be in that situation. But I don�t really look at it in a broader way. Christopher Guest: See, I don�t get out enough, then, because I don�t hear that. There are people who stop you on the street and say things every once in a while. Like, �Move out of the way,� they�ll say. Occasionally a guy� what guy? Some guy in my world � it�s a little disorienting because we�ve been traveling a lot � some guy said to me something about �this knob going to eleven,� which was a reference to Spinal Tap, which I hear three times a day. Now, it�s so frequent you just say, oh� I don�t know what to say. I don�t know what I�m supposed to say. �This goes to eleven.� I guess you�re part of this, too. Good. Is it amazing after all you�ve done that you can keep juicing each other with improvisational work? Eugene Levy: But we still think about you. Christopher Guest: But literally I�m looking at their faces every day. It�s weird. Chris was telling us you�re doing four movies while he is making his one film� How do you manage to balance all of these movies and keep sane? Parker Posey: Yeah. That�s the word. Separate yourself and try to relax. I have all of these movies that I�ve been attached to since, you know� two, three, four years. They were all getting financed at the same time. So you can make a movie for a million dollars. So I went back to where I started in my career � making [indie] million dollar movies. I did Fay Grim. I did Spring Breakdown. Harry Shearer: The indie Superman. 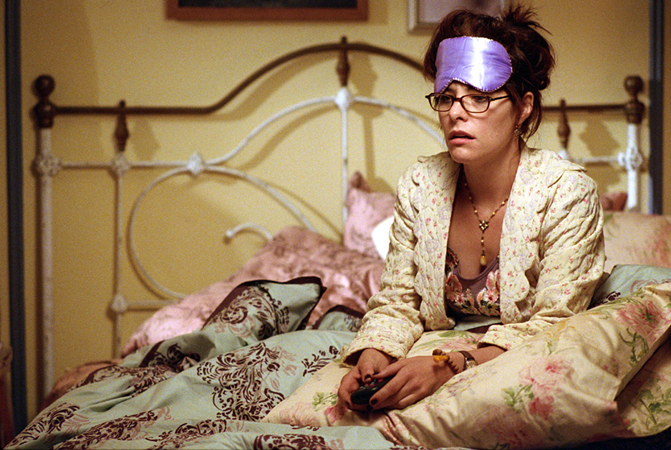 Parker Posey: And the indie Superman. So they all just kind of like � you know, you just have to go with it. They all kind of came at the same time. Is it a huge adjustment going from Chris� improv style to other more traditional roles? Catherine O�Hara: Uh. I just don�t work that often. I really don�t. If I get offered something and I read the script, it has to have something in it, because ultimately it�s your face on camera. Like, �why did you do that?� Well, if you�d read it� It was good, I swear it was good. Seeing that, you know, people that you want to work with. I have to grab onto something that makes me want to take my time and effort. If you work with good, confident people, you can still feel like you have something to offer. If you start with a great script, I did some Six Feet Unders, and it�s so well written. I was not inclined to change a word. You know, it was like, oh, yeah, thank you. Yeah, I�ll do this. Harry Shearer: I�ll take it. Any bids for nineteen? To have the show still be here and relevant satire, do you feel blessed to have two such outlets in your career? Harry Shearer: Yeah. I think anybody who�s on a hit anything is blessed. Anybody who�s working in show business � five percent of the members of the Screen Actors Guild are working. Five percent. That�s like the number of Americans with a passport. So, A) You�re working. B) You�re on a hit. C) You�re on a good hit. D) You�re on a hit that�s lasted eighteen years. Good lord, you know? How lucky can you get? Harry Shearer: Well, you can ask for more money. #1 � 2006. Courtesy of Warner Independent Pictures. All rights reserved. #2 � 2006. Courtesy of Warner Independent Pictures. All rights reserved. #3 � 2006. Courtesy of Warner Independent Pictures. All rights reserved. #4 � 2006. Courtesy of Warner Independent Pictures. All rights reserved. #5 � 2006. Courtesy of Warner Independent Pictures. All rights reserved. #6 � 2006. Courtesy of Warner Independent Pictures. All rights reserved. #7 � 2006. Courtesy of Warner Independent Pictures. All rights reserved. #8 � 2006. Courtesy of Warner Independent Pictures. All rights reserved. #9 � 2006. Courtesy of Warner Independent Pictures. All rights reserved. #10 � 2006. Courtesy of Warner Independent Pictures. All rights reserved. #11 � 2006. Courtesy of Warner Independent Pictures. All rights reserved. #12 � 2006. Courtesy of Warner Independent Pictures. All rights reserved. #13 � 2006. Courtesy of Warner Independent Pictures. All rights reserved.